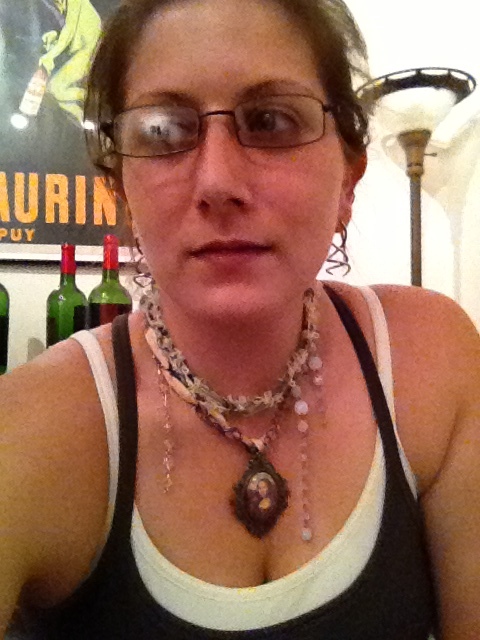 Much of this past week has sped past as if in a blur – even my yoga classes seemed to go by too quickly. 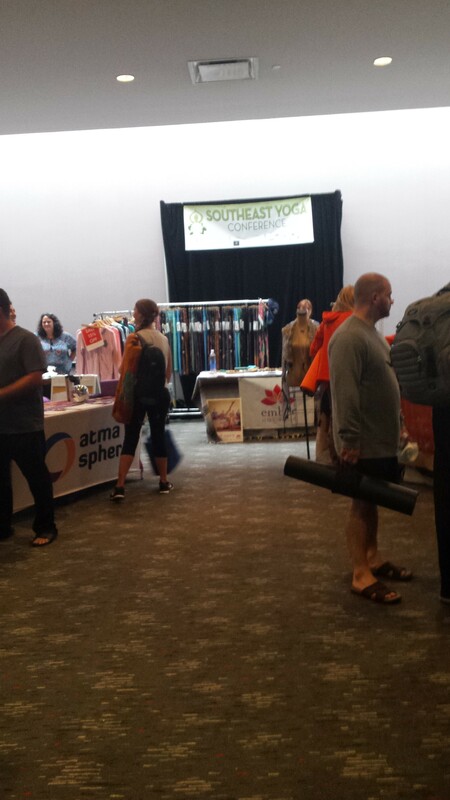 However, I was able to slow down on Sunday, and attended the Southeast Yoga Conference for one of the final workshops of the conference. 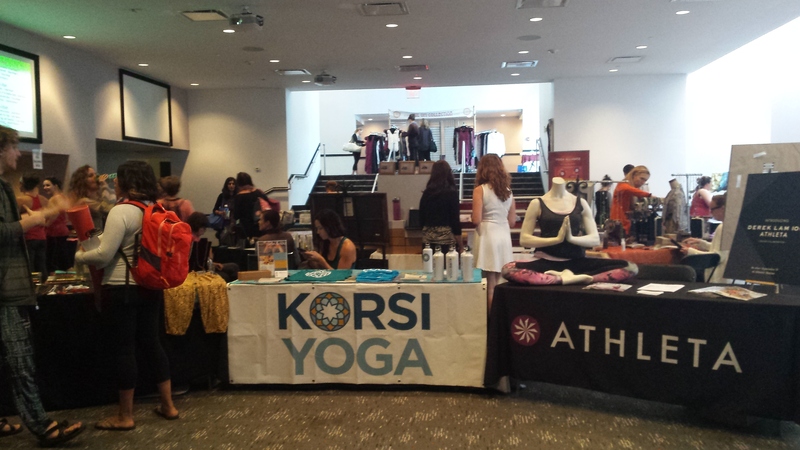 Held at the W Midtown, it was somewhat confusing to find exactly where to go to register, though once I found the registration desk in the downstairs conference room area, I was incredibly excited to see yogis from studios and vendors alike gathered into the merch area. Coming down the escalator, I was welcomed into the merch area, where yogis could purchase everything from a relaxing massage to a new yoga mat, from mala beads to a new outfit. It was an incredibly light and airy merch area, which is completely different from other conferences I have attended (ahem… DragonCon… cough cough…). That’s not to say one is better than the other, but the differences between the two is incomparable. 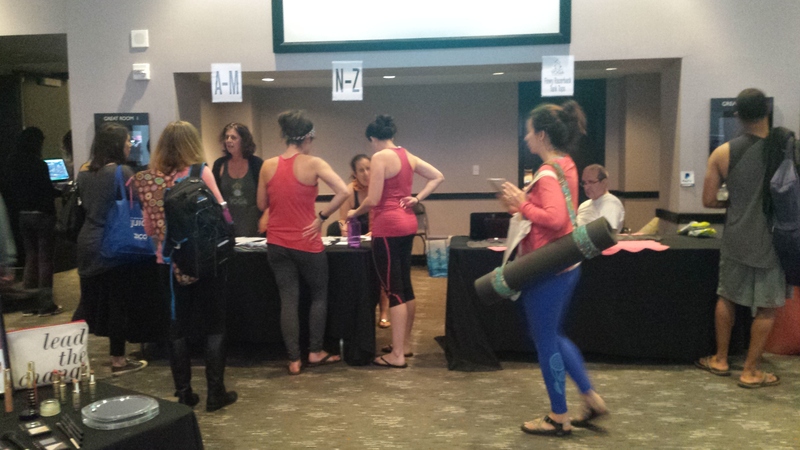 I met Melissa Katz, one of the Founders & Leaders of the SEYC, at the registration table – who’s an incredibly sweet lady I was so excited to meet – and another Atlanta yoga instructor named Suzanne. 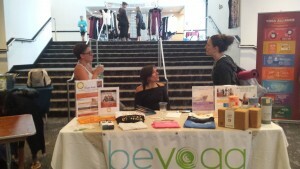 Both ladies were incredibly helpful to someone who’s never attended the SEYC. Everything went smoothly with my on-site registration (the site and PayPal both went down as I tried to pay ahead of time), and I was directed to one of the great rooms next to registration for the Yin class I so desperately needed. The lights were dim and yogis from all over were setting up their mats, discussing the upcoming class with the lovely Taylor Harkness (our instructor for the afternoon), relaxing and meditating before the class began – and there was me, walking around aimlessly trying to figure out who to hand my registration paper to and where to set up. Just as class was beginning, I was noticed and handed over my information to make sure I was accounted for. 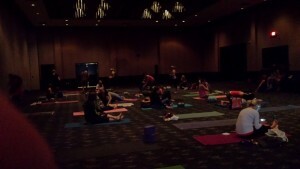 The lights came up, the music went down, and Taylor asked us all to move in a little closer so that we could open the workshop with a discussion about the practice of Yin and its importance in balance with a more vigorous yoga practice (If you’ve never taken a Yin class, I highly recommend it! They’re amazing!). Taylor also shared his exciting news of him and his partner’s new family addition – a cute little puppy! His happiness made me smile. Taylor’s energy throughout the discussion and the practice was incredible and it truly lightened the atmosphere, as it seemed many of us weren’t sure where the practice was going to lead us. I made a new friend during a partner exercise involving the stretching of all of the entire upper leg (4 stretches which felt ah-may-zing). Having never worked with a partner for anything in yoga, it was an enlightening experience that I really enjoyed, and renewed my interest in partner AcroYoga (something I’ve always wanted to try). 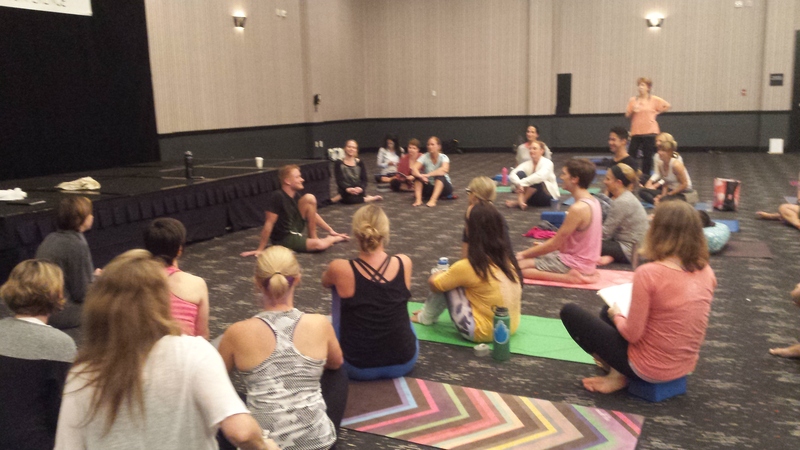 After getting into the crevices of our upper legs and hips, we split to our individual practice session, where we held several poses for long increments (as a Yin practice typically requires), though some of the poses I was unfamiliar with. Having attended many Yin classes, I always like to experience one that shakes it up a bit (I’ve experienced many of these with Douglas Johnson at evolation Midtown). I found relaxation in each of the poses, regardless of how demanding they immediately seemed (cough… Pigeon for 5 minutes… cough..), and I left the class with a sense of openness and renewal, which is what I needed after a stressful week of decision-making (if you know me, you know that decision-making is not always my strong point!). Yummy bags of popcorn (which were also included in my awesome goodie bag) were being given away for free, with it being said several times, “Take a whole box! Please!” I grabbed a few extra (because who doesn’t love free, mostly healthy popcorn? 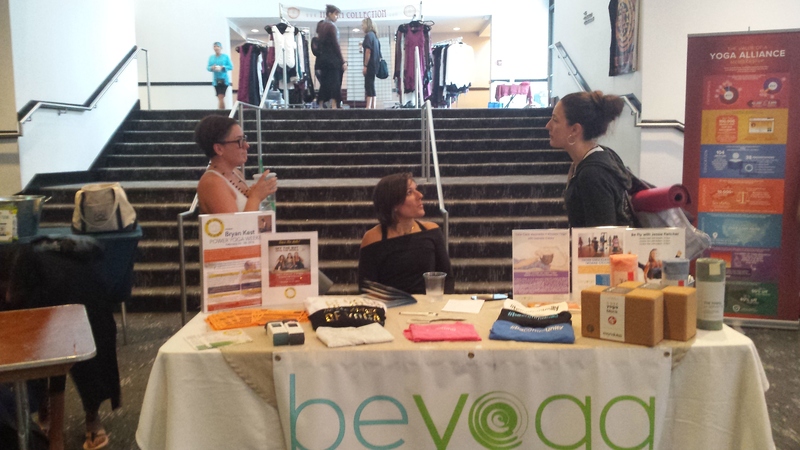 ), said good-bye to Julie Newton from BeYoga as she was packing up the table, and noticed that many other vendors were already packed up and heading out. 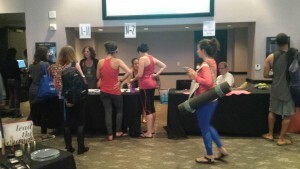 While I’ve witnessed things like this happening at the end of a conference, it seemed very strange that many vendors were packing up though there were still yogis leaving workshops. I was hoping to get to take some more time and walk around to each vendor, but alas, it wasn’t a possibility. 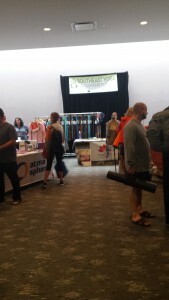 The possibility, however, is that I’ll be able to attend the Southeast Yoga Conference in the future and experience its growth and explore all of the vendors in attendance in upcoming years. That means – time to buy all of the things! Ha! Though that’s mostly a joke (mostly), I really would’ve liked the opportunity to explore their wares after the workshop when things weren’t so hectic around that area.